My visitors don’t get a free ride, coming to stay with me. There’s rent to be paid. One brick, per person, per day. Simple. My part in this is collecting lots of newspapers at every opportunity. Leftovers of the free papers, after they become “yesterday’s news”. Occasional bought newspapers. All heaped up in the storeroom awaiting the arrival of the next unsuspecting guest, who back in the UK had said “Gosh that sounds easy, yes of course we’ll make a load of papier-mache bricks for you Tamara”. First task is the tearing into strips. About eight or ten newspapers at a time, torn lengthways into long strips. Easy, but quite tiring on the arm muscles after a while. These strips then need to be separated, draped across a bucket of water forming as intricate a web as possible, a sort of cat’s cradle, before they are pushed down into the water in gloopy batches. Nothing needs to be added, the recipe is solely newspaper and water. Two big bucket-loads are then left overnight to soak. N ext day, the heavy buckets are carried out to the street, along with the Green Eko-Log Machine. 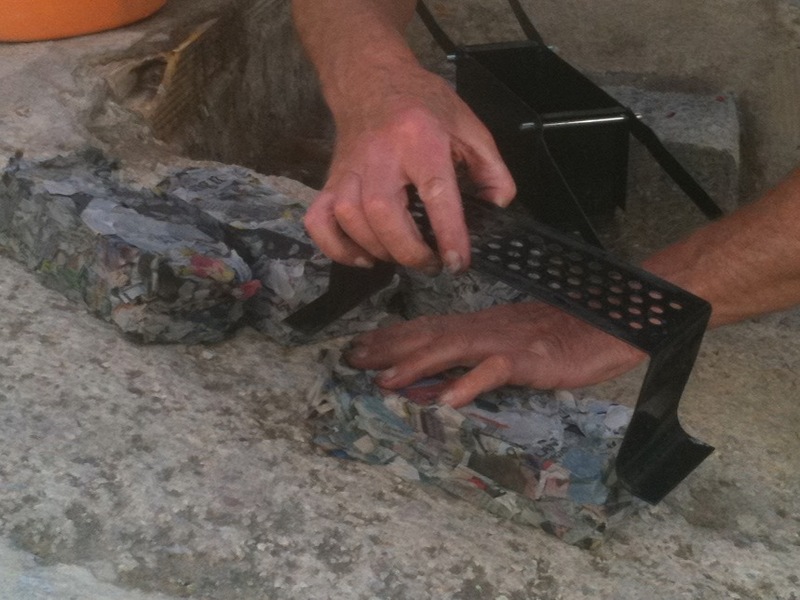 Handfuls of wet newspaper are glooped into the log-maker, the top press is fitted on, then it’s white-knuckle time as the water is squeezed out by sheer muscle-power. Out comes the top press, then carefully the compressed brick, log, or briquette, is lifted out and laid on the terrace to dry. 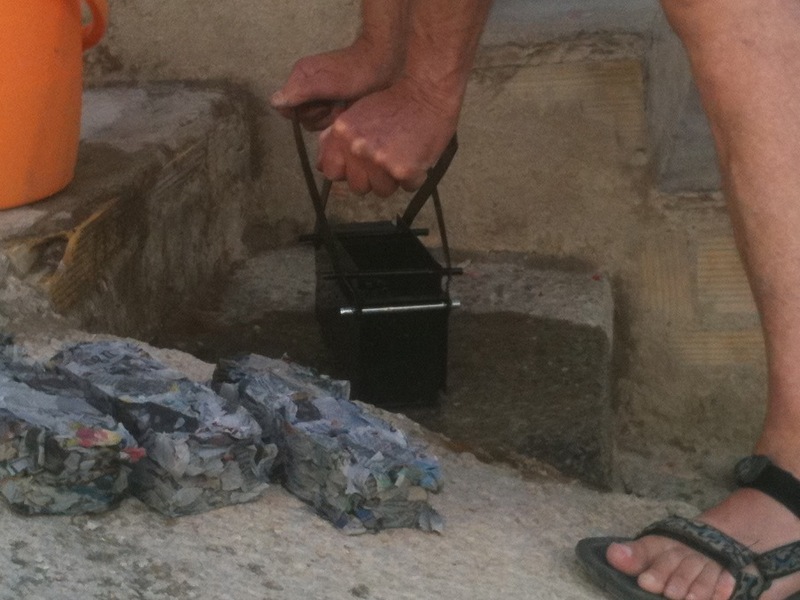 Twenty-four hours later, those briquettes are ready to be stacked in the storeroom. A new heap of newspapers glowers down from the shelf. The visitors pretend not to see these, deposit their dry briquettes and beat a hasty retreat, proud of the 6 or 7 bricks they’ve made, but not quite so keen to start all over again. For me, every brick made is a log I won’t need to buy for the winter cold. 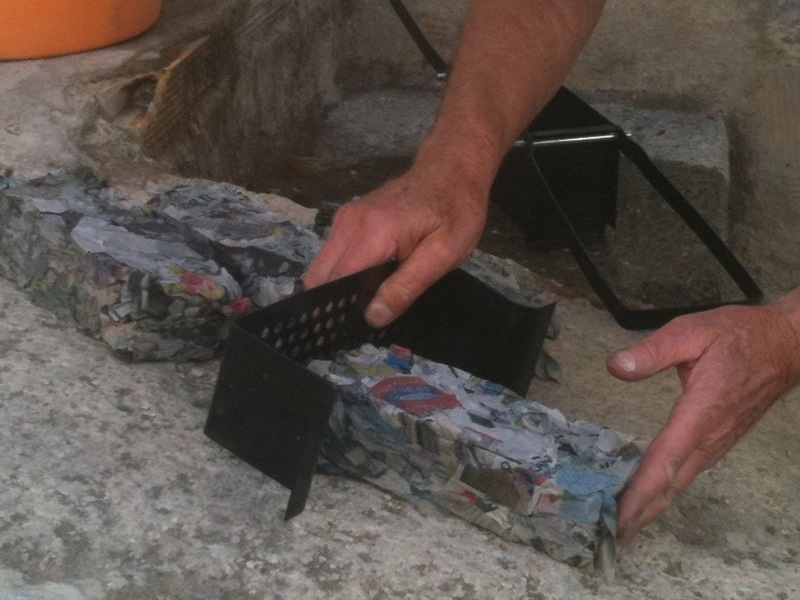 Amazingly, these paper briquettes burn well and slowly, and will feed the woodburner (along with a large delivery of wood) until the sunshine returns to begin to dry out next season’s gloopy bricks. This entry was posted in Spain and tagged Andalucia, Axarquía, Colmenar, Spain, SpanishBlog, Tamara Essex by tamaraessex. Bookmark the permalink. All in all it’s just another brick in the wall …… i remember you telling us about your rental fees when we had tea. Try adding a little washing up liquid to the mix and it helps break up the paper. If you have kids about let them make paper balls and flatten them into half pounder size burger shapes and they burn just as good.